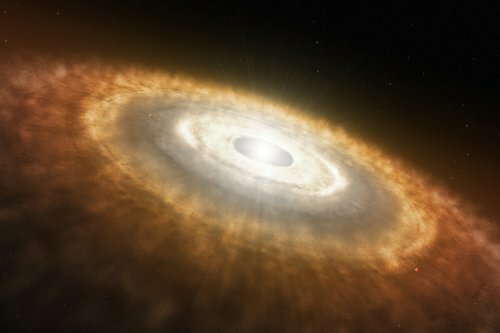 The windy weather inside an infant star explains why T Tauri stars have disks with a distinct glow in infrared light, a new research indicates. Using the Atacama Large Millimeter/Submillimetre Array (ALMA), astronomers noticed for the first time the signs of windy weather inside a T Tauri star, a star similar to our Sun, but much younger. This phenomenon may explain why so many T Tauri stars share disks that seem to glow when examined in infrared light, while other starts emit light in a familiar spectrum. Salyk and her team used ALMA to search for clues of a wind in AS 205 N, the T Tauri star located 407 light-years away, in the constellation Ophiuchus the Serpent Beares. For a long time, this star intrigued the scientists with its peculiar infrared signature. ALMA’s remarkable resolution and sensitivity allowed researchers to analyze the distribution of carbon monoxide surrounding the star. Carbon monoxide does a fantastic job tracing molecular gas that is the origin of every star and its disks involved in creating plants. As researchers studies the data, they confirmed it was indeed gas that was leaving the disk’s surface, as if carried by a present wind. The scientists however, were not able to understand the why the wind’s properties were different from what they expected. It is possible the differences between observation and expectations could be attributed to AS 205 N nature, being part of a multiple star system; its sibling, named AS 205 S, is also a binary star itself.